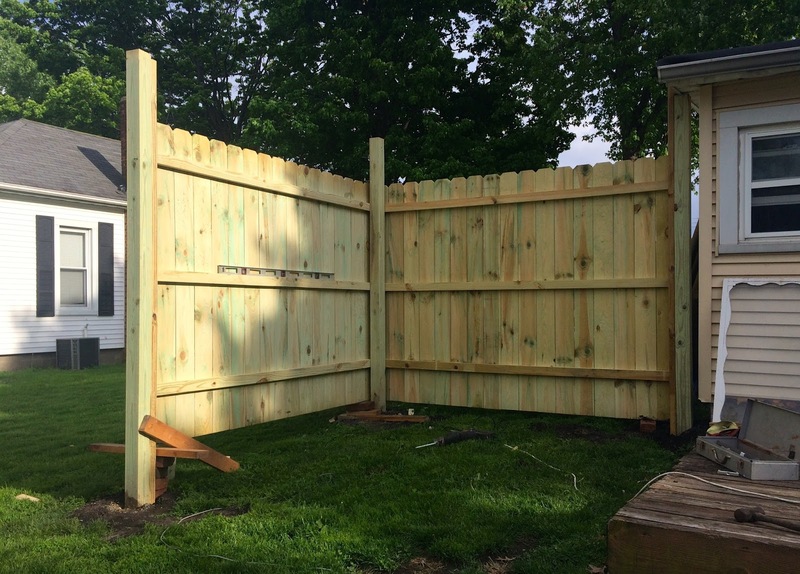 Our new fence is officially up! 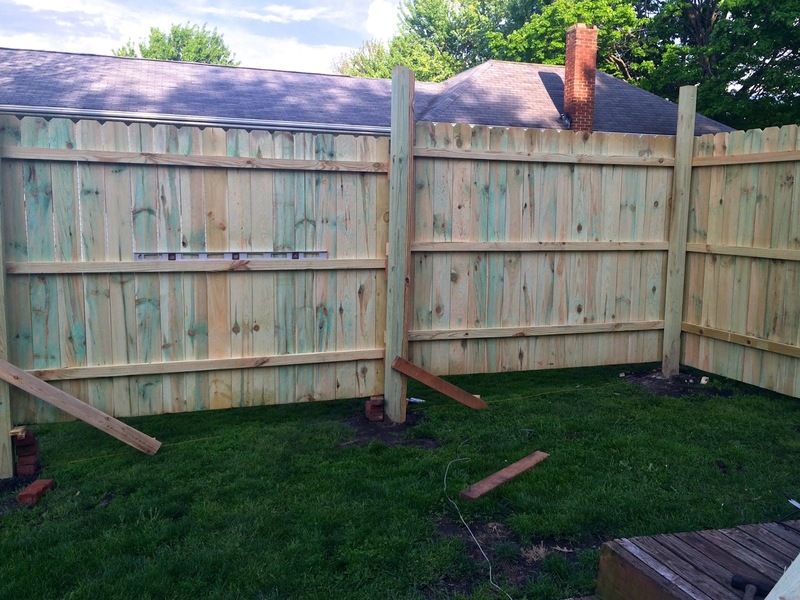 That's right, we put in a privacy fence for the back patio area. This is a project Trent was dying to do, so we figured we'd do it as soon as the weather cleared up and got a little nicer. 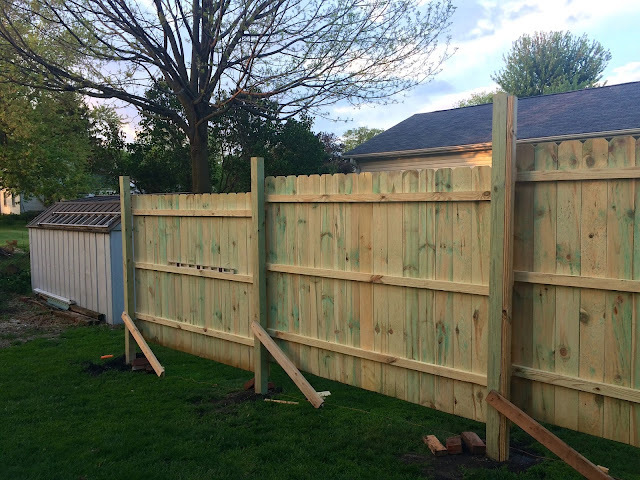 We've been wanting some privacy in the yard, and until we fence in the whole backyard, we thought we would just build a fence by the patio for now - that way we don't feel like the neighbors are watching our every move through the windows! 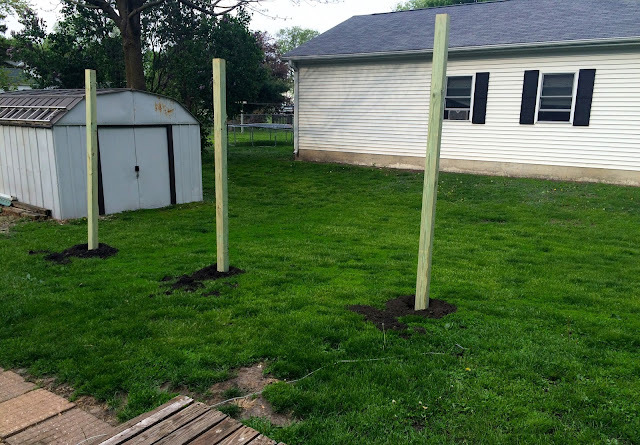 Last week Trent dug some holes for the posts and got them put in the ground and secured with cement. 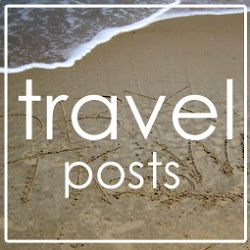 There were 5 posts total for the area we covered. Trent did almost the entire thing by himself, and this is the first fence he's ever put up. It was a tricky one, too, because it goes gradually down hill. 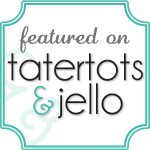 There are still a few finishing touches to be done, but we got it fully up last night at least. 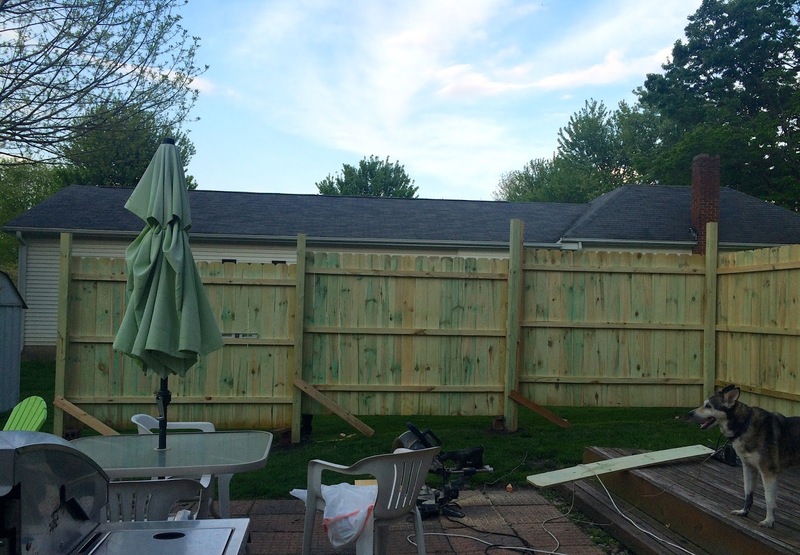 I helped put the panels up yesterday, and it felt pretty good with each one done. Slowly but surely, our neighbors' windows disappeared from view, and we felt like we had a little privacy for the first time! We used 4 pre-assembled panels, and they are all a little staggered, or "stair-stepped" with each panel, since they go downhill. This keeps about the same distance at the bottom of each panel. 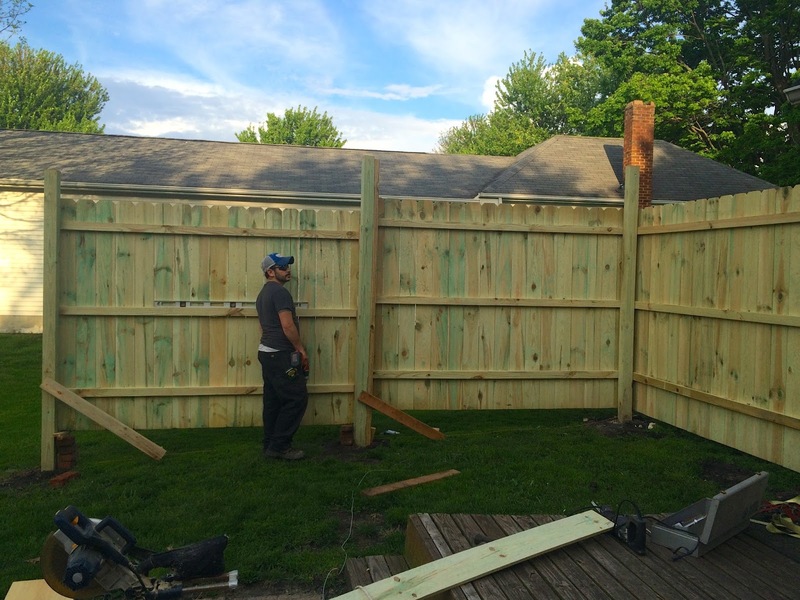 We used a level to make sure each panel was completely straight before Trent drilled them onto the posts, and we got them up to the correct height by stacking bricks under each panel until it was level. Trent had to attach a few 2 x 4's to the fence posts to help hold them while the cement fully cured. The tops of the posts of course will be cut down to be more in line with the tops of the fence. The wood is pine and has a bit of a green tint to it right now because it's treated wood. This means it has a chemical on it that helps to prevent rotting. In a month or two, after it's had a little time to dry out in the sun, that will fade a bit, and we'll be able to stain it. I'm pretty happy with the way it turned out. 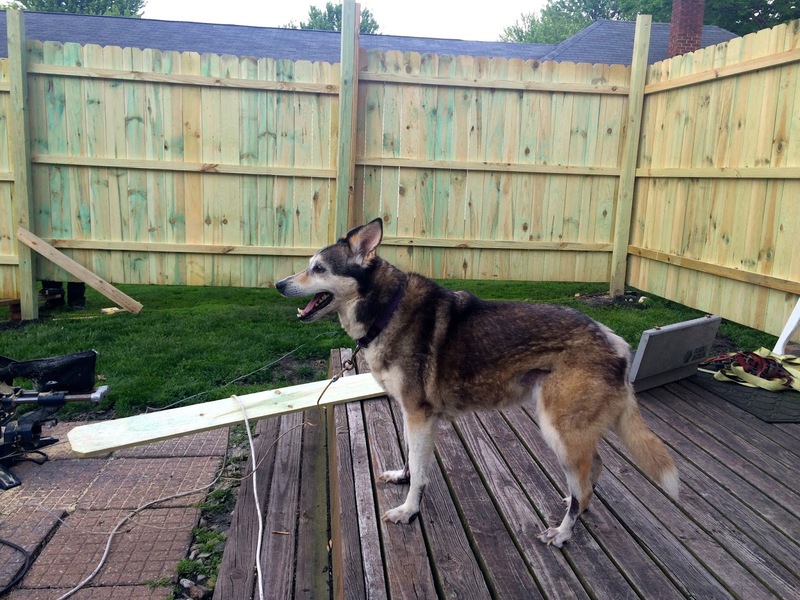 And Saleen was really happy that we got the fence put up, too! Trent also got an extra panel and a couple of extra posts in case we wanted to go further, but I think for now we might leave it the way it is. Now we just have to fix up the patio area back here. Some new patio furniture might be nice! 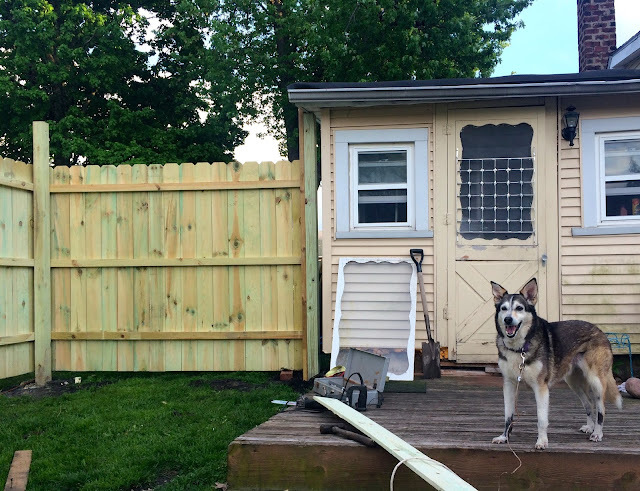 It's not perfect and there are still a few areas to finish up, but the fence is up, and we're excited. 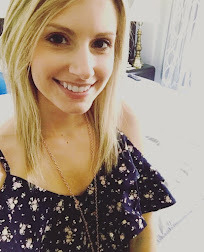 All ready for some fires and barbecues this summer!